Finely slice the leek and the Belgian endive. 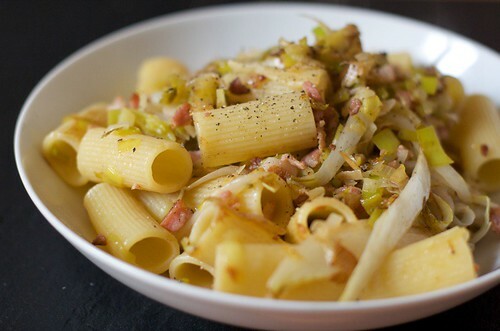 In a large no-stick pan, heat the diced bacon and when the fat is begin to split out, add endive and leek. Stir fry for few minutes, then add the wine and let evaporate. In the mean while, cook the pasta according to the package instructions. Drain it al dente (the pasta must still have a slightly hard heart) and toss it in the endive and leek pan. Give a good stir and serve immediately. I love simple inspired food like this. Perfect winter dish. I’ve read your recipe and it looks really nice. I’m a Sicilian living in UK, and I’ve been looking for endive for a while, with no luck. I’d like to cook Focaccia Messinese (we use something called scarola, or indivia) do you know any chain that is selling it?